The fact that these attitudes could take root on the Western Front, where the ethnic differences between the two sides were in fact quite minimal, was an indication of how easily hatred could flourish in the brutalizing conditions of total war. In other theatres of war, where the differences were deeper, the potential for unconstrained violence was greater still. 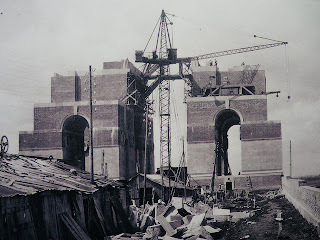 Building the memorial with its sixteen tiers of red brick, faced with Portland stone. It is 150 feet (46 m) high, with foundations 19 feet (6 m) thick; required due to extensive wartime tunnelling beneath the structure. It was built between 1928 and 1932 and is the biggest British battle memorial in the world. It was inaugurated by the Prince of Wales (later King Edward VIII) in the presence of Albert Lebrun, President of France, on 31 July 1932. The Thiepval Memorial serves as an Anglo-French battle memorial to commemorate the joint nature of the 1916 offensive. In further recognition of this, a cemetery containing 300 British Commonwealth and 300 French graves lies at the foot of the memorial. Many of the soldiers buried here are unknown. 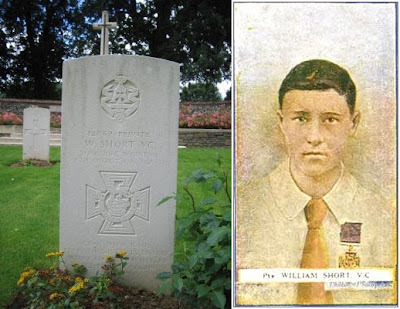 The British Commonwealth graves are rectangular and made of white stone, while the French graves have grey stone crosses. 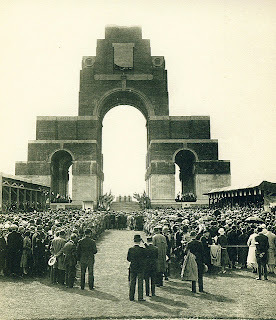 Each year on 1 July (the anniversary of the first day on the Somme) a major ceremony is held at the memorial. There is also a ceremony on the 11 November, beginning at 10.45. These two remarkable photographs of the Thiepval memorial were taken from the Second World War by a Royal Engineers officer in September 1944 after the D-Day landings. 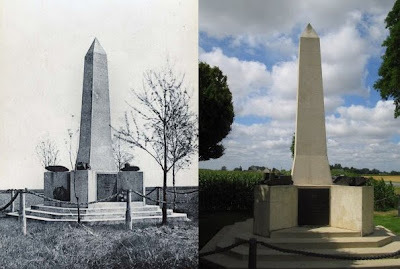 The photo on the right was taken from the Ulster Tower and shows Thiepval Wood and Connaught Cemetery on the right with the memorial off in the background. Plaque at the entrance honouring the nine Victoria Cross winners of the 36th (Ulster) Division during the Great War, four of whom won it on the opening day of the Somme campaign: Captain Eric Bell, Lieutenant Geoffrey Cather, Private Billy MacFadzean and Private Robert Quigg. On Saturday 19 November, 1921, in dedication to the contributions of the 36th Ulster Division during the Great War, the Ulster Memorial Tower, was unveiled by Field-Marshall Sir Henry Wilson in Thiepval, France, marking the site of the Schwaben redoubt, against which the Ulster Division advanced on the first day of the Battle of the Somme. The tower itself is a replica of Helen's Tower which is situated at Clandeboye, County Down. It was at Helen's Tower that the men of the then newly formed Ulster Division drilled and trained on the outbreak of World War I. For many of the men of the 36th (Ulster) Division the distinctive sight of Helen's Tower rising above the surrounding countryside was one of their last abiding memories of home before their departure for England, and subsequently, the Western Front. 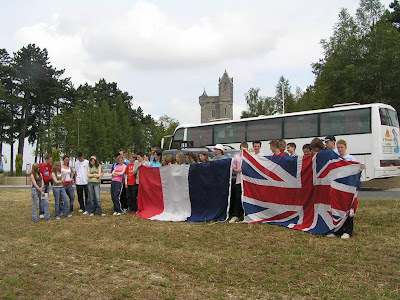 Flags flown at the Thiepval Monument in the summer of 2008. The period aerial photograph is from an original taken before the 1st July and shows the German trench system from Thiepval Wood (on the left of the image) across to the village. The intricate nature of the German defences and their obvious strength and depth are quite apparent from this photo; at least from the benefit of more than ninety years. In 1916 as good as this aerial intelligence was, it was believed that artillery alone could destroy positions like this on the Somme front; something that 1st July 1916 would prove otherwise. The present-day aerial view shows the site of the Ulster Tower, Connaught Cemetery is on the edge of Thiepval Wood and Mill Road cemetery on the crest of the hill. The infamous Schwaben Redoubt dominated the landscape and can be found between Mill Road cemetery and the copse of trees near the top left of the picture. Just across from Ulster Tower is this cemetery that holds the graves of 1,268, half of whom remain unidentified. In March 1926, an explosion about 20 yards away managed to damage a number of headstones. Behind the cemetery is Thiepval Wood where soldiers from the 36th Division attacked on July 1, 1916. This cemetery near the Ulster Tower marks one of the entrances to underground strongholds from which the Germans would emerge to create devastation on attacking forces. Mill Road Cemetery (originally known as Mill Road Cemetery No. 2) was made during the spring of 1917, when the German withdrawal to the Hindenburg line allowed the battlefield to be cleared. At the Armistice, it contained 260 burials, but was then greatly enlarged when graves were brought in from the battlefields of Beaumont-Hamel and Thiepval. Because of the subsidence of the ground, many of the stones are laid flat. 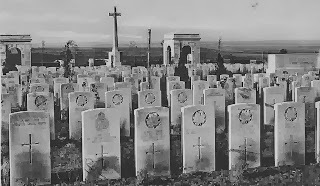 Today there are 1,304 Commonwealth servicemen of the First World War buried or commemorated here, 815 of whom remain unidentified with special memorials to three casualties believed to be buried among them and three others buried in Divion Road Cemetery No.1, whose graves were destroyed by shell fire. The village of Pozières is on the Albert-Bapaume road atop a ridge in the centre of what was the British sector of the Somme battlefield. 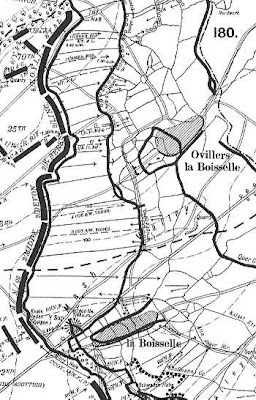 Nearby is the highest point on the battlefield and, while the Somme terrain is only gently undulating, any slight elevation aided observation for artillery. 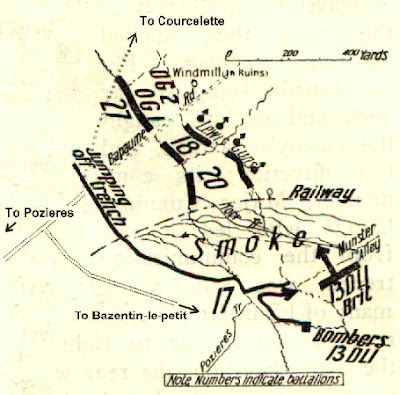 Therefore, Pozières was critical to the German defences and it formed an outpost to the second defensive trench system which became known to the British as the "Old German Lines" or "O.G. Lines." 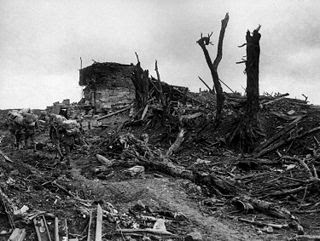 The village was completely destroyed in World War I during what became the Battle of Pozières, which was part of the Battle of the Somme. The village was subsequently rebuilt, and is now the site of several war memorials. The Australian flag flies over Pozières in recognition of the sacrifice of the ANZACs in the Battle of Pozières. Amongst the British and other Commonwealth forces who fought at Pozières, the Australians suffered over 5,000 killed, wounded or taken prisoner. The photo on the left is taken from an observation platform erected on top of what had been an imposing German concrete shelter known as Gibraltar; you can just make out the Thiepval Monument from the top of the trees in the background. Road sign on the D929 just before Pozières indicating the position of the front line on 1 September 1916 at the Battle of the Somme. The Battle of Mouquet Farm, which began on 8 August 1916, was part of the Battle of the Somme and followed the Battle of Pozières. During the battle, the Australian divisions of I Anzac Corps advanced northwest along the Pozières ridge towards the German strongpoint of Mouquet Farm, with British divisions supporting on the left. As that battle dragged on, the Canadian Corps took over from the Australians. By the time the battle concluded in mid-September, the German garrison still held out. 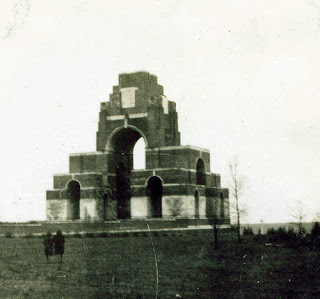 The farm was eventually captured on 27 September following the general attack of the Battle of Thiepval Ridge. The colour painting shown on this German postcard from the time was one of a series produced by the 26th Reserve Division that occupied this area for more than 2 years from September 1914 through late 1916. It shows what the farm must have looked like after the initial attack. Later in the war a large underground dugout that could contain up to 300 men as well as supplies, a headquarters, medical facilities, etc. was complete the week before the British attack on 1 July 1916 when elements of the 36th Ulster and 32nd Divisions attempted to Capture the position and the farm. The Salford Pals was almost destroyed in the fighting on 1 July for this location. which during the war was known as "Dead Man’s Road". The Memorial commemorates over British 14,000 dead and 300 of the South African Forces who have no known grave and who died on the Somme from March 21 to August 7, 1918. Among those regiments and corps represented are The Rifle Brigade with over 600 names, the Durham Light Infantry with approximately 600 names, the Machine Gun Corps with over 500, The Manchester Regiment with approximately 500 and The Royal Horse and Royal Field Artillery with over 400 names. Enclosed within the memorial is the Pozieres military cemetery. There are 2,755 British Commonwealth dead of the Great War either buried or commemorated here, 1,375 of whom remain unidentified.There are also special memorials to 23 casualties believed to be buried among them. On the night of the July28-29 1916 near Pozières during a night attack, the infantry was temporarily driven back by the intense machine-gun fire from the enemy trenches. Many wounded were left in No Man's Land lying in shell holes. Sergeant Castleton went out twice in the face of this intense fire, and each time brought in a wounded man on his back. He went out a third time and was bringing in another wounded man when he was himself hit in the back and killed instantly. Around the obelisk are four models of tanks used during this period, one showing the scars from the Second World War. This photo shows a replica Mark IV Heavy tank. The fence surrounding the monument is made up of six pounder gun barrels from tanks linked by driving chains from the time. Here in a a two-army assault launched by Sir Douglas Haig on September 15 at dawn, the Canadian Corps assaulted on a two-kilometre front near the village of Courcelette. Advancing behind a creeping barrage, the infantry was aided by the new weapon, the armoured tank, throwing the enemy into complete confusion. 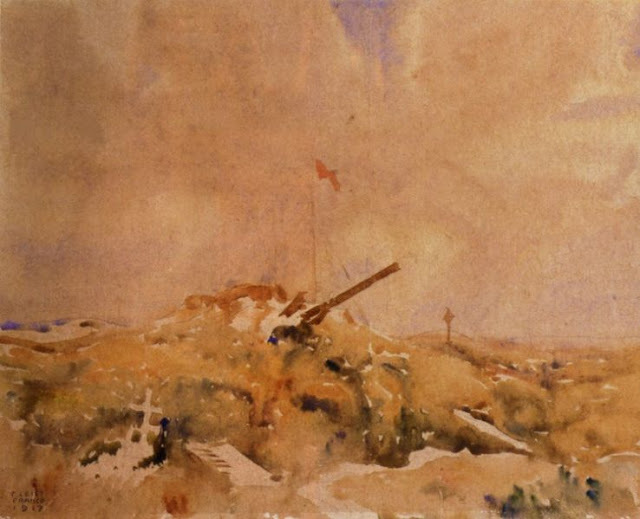 By 8:00 a.m. the main objective, a defence bastion known as the Sugar Factory, was taken, and the Canadians pushed ahead to Courcelette. Numerous German counter-attacks were successfully repulsed and by the next day the position was consolidated. It is fitting, therefore, that the memorial to mark the 11 weeks of bloody fighting by Canadians on the battlefields of the Somme should be sited at the scene of their initial victory in that long and costly struggle. 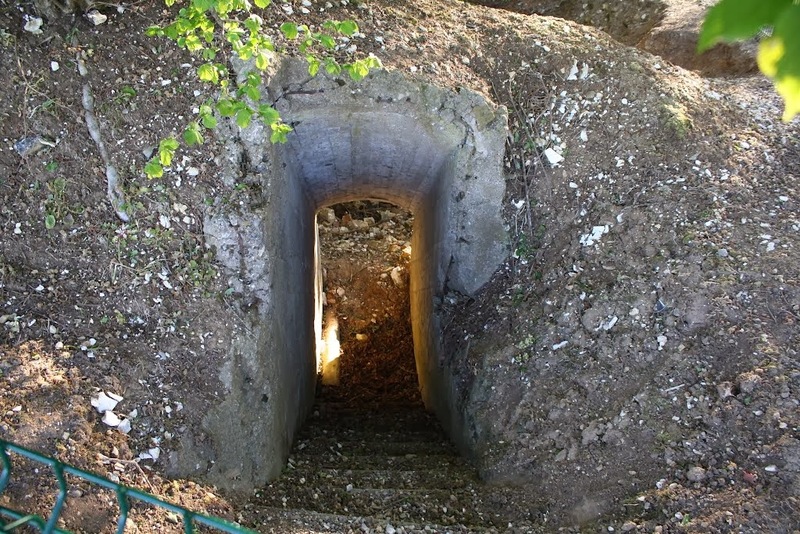 Regina Trench (Staufen Riegel) was a German trench dug along a ridge running from north-west of the village of Le Sars, south-west to Stuff Redoubt (Feste Staufen), close to the German fortifications at Thiepval on the Somme battlefield. It was the longest such trench on the German front during World War I. 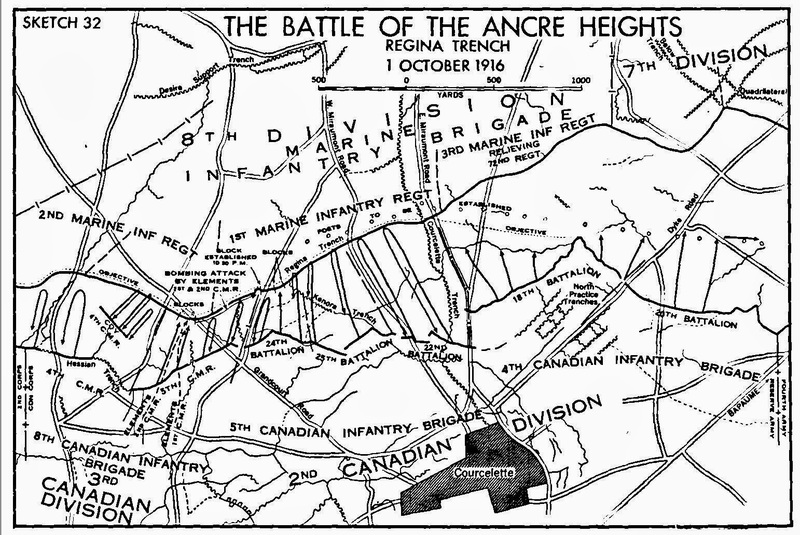 Attacked several times during the Battle of the Ancre Heights, the 5th Canadian Brigade briefly controlled a section of the trench on 1 October but were repulsed by counter attacks. An attack on 8 October by the 1st and 3rd Canadian Divisions on Regina Trench also failed; on 21 October the 4th Canadian Division in an attack on the trench with the 18th, 25th and 39th divisions attacking the western part of the trench, (known as "Stuff Trench") briefly captured sections of the trench but were again pushed out by German counter-attacks. 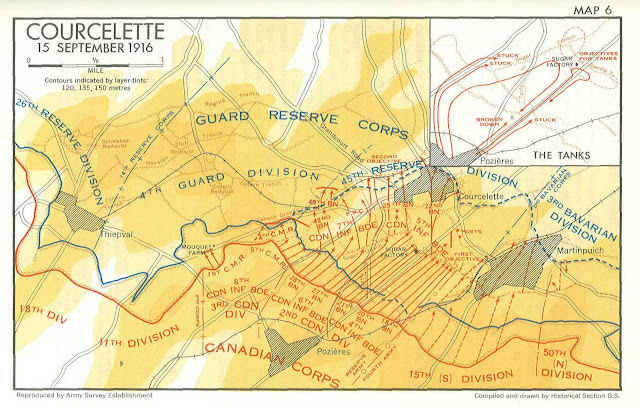 After two months of attacks and constant shelling the trench was taken by a night attack on 10/11 November by the 4th Canadian Division. The 46th (S. Saskatchewan) and 47th (Br. Columbia) battalions of the 10th Brigade, with a company of the 102nd Battalion, crept close to the line and attacked eight minutes after the barrage lifted, surprising the German garrison and taking 87 prisoners and four machine-guns, for a loss of 200 casualties; several German counter-attacks were defeated. 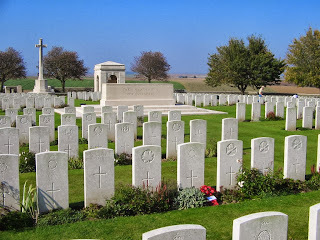 The cemetery itself is located astride the location of the infamous trench and contains 2,279 burials and commemorations of men killed at or near the trenchline during the First World War. 1,680 of the men are identified as British, 564 Canadian, 35 Australian, one American airman and 1,077 burials of unknown soldiers, with special memorials to 14 casualties believed to be buried among them. Most of the men buried at Regina Trench fell in battle between October 1916 and February 1917 and the original portion of the cemetery was established during the winter of 1916–1917. After the armistice in 1918 the Regina Trench location was selected as a "concentration cemetery" with mortal remains brought in from scattered graves and small battlefield cemeteries surrounding the nearby villages of Courcelette, Grandcourt and Miraumont. Unlike many CWGC cemeteries where men are laid one-to-a-grave, many of the graves contain more than one burial and where two names are shown on the one headstone, it is necessary to count the individual names in order to find the correct grave location. The CWGC website states that Regina Trench Cemetery is located in Grandcourt but this is somewhat misleading because whilst it is located between Grandcourt and Courcelette it is most easily reached by a rough road that runs approximately a mile northwest of Courcelette village. Today the village of Contalmaison on the D147 and D20 crossroads, roughly 30 miles northeast of Amiens, has a population of about an hundred. It was first attacked on the opening day of the Somme campaign and some elements of the 16th Royal Scots, 34th Division, managing to reach it. On July 7th units from the 23rd Division reached the village and released British soldiers captured earlier. It finally fell on the 11th when several battalions of the Yorkshire Regiment (Green Howards) took the village. 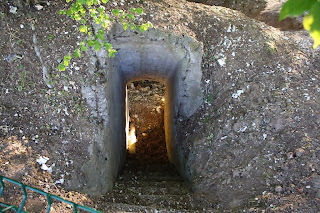 The Germans had previously used the Chateau (the ruins of which can be seen in the photo directly below) as their headquarters and Dressing Station; it was then taken over by the British and used for the same purpose. The fighting then continued towards Pozières and Mametz Wood. Between the wars with the ruins of the chateau behind. Memorial to the 16th Royal Scots (McCrae's) Battalion Nearly three-quarters of the 16th Royal Scots (“McCrae’s Own”) battalion became casualties on the first day of the Somme campaign, including several Heart of Midlothian footballers. Nevertheless, this battalion managed to gain the most advanced penetration of the enemy line anywhere on the front that morning with some entering Contalmaison deep inside the German lines. The Scottish saltire flies alongside the French flag. This memorial was erected in 2004 from stone brought from Scotland. For most conspicuous bravery. During an attack a very heavy enfilade fire was opened on the attacking company by a hostile machine gun. 2nd Lieutenant Bell immediately, and on his own initiative, crept up a communication trench and then, followed by Corporal Colwill and Private Batey, rushed across the open under very heavy fire and attacked the machine gun, shooting the firer with his revolver, and destroying gun and personnel with bombs. This very brave act saved many lives and ensured the success of the attack. Five days later this very gallant officer lost his life performing a very similar act of bravery. 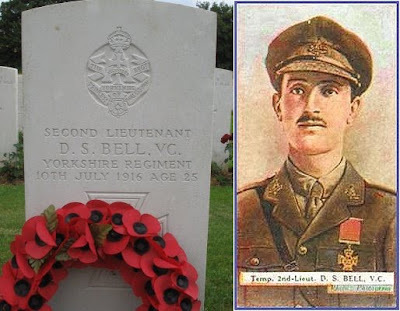 Bell was killed in Contalmaison and the spot he and his unit were defending was named Bell’s Redoubt in his honour. Today this memorial stands, placed there in 2000 by the Green Howards and the Professional Footballers’ Association in part to commemorate the fact that he was the only professional footballer to be awarded the Victoria Cross. Peake Wood was the name given by the army to a copse on this road which fell to the British on 5 July 1916. It was used as a front line cemetery until February 1917 and was in German hands from the end of March 1918, until nearly the end of the following August. The cemetery contains 103 burials. The graves of British soldiers killed in the Great War have been covered with Nazi symbols in an act condemned as "appalling desecration". Vandals painted swastikas and SS insignias on the headstones of 32 Scottish soldiers who died during the Battle of the Somme. 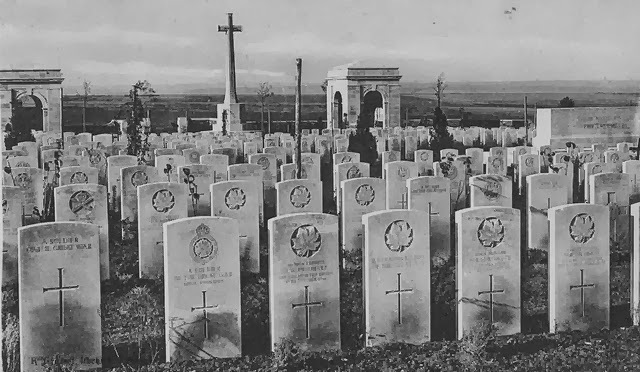 The attack caused thousands of pounds worth of damage at the Peake Wood Cemetery near Contalmaison, France, just days before Remembrance Sunday. The cemetery marks the spot from which the final assault was made on Contalmaison on July 1, 1916, the first day of the battle on which nearly 20,000 men lost their lives. The 16th Royal Scots, known as McCrae's Battalion, lost almost 75 per cent of their troops. Many of them were laid to rest at the small cemetery, which records 103 fallen Allied soldiers. Jack Alexander, who wrote the history of the battalion, said he was disgusted by the incident, which is being investigated by French police. He added: "It's impossible to gauge the mindset of the kind of idiot who does something like this, but I hope they can be caught, otherwise more memorials could be at risk." Peter Francis, a spokesman for the Commonwealth War Graves Commission said it took a whole day to remove the graffiti: "We were shocked and very, very angry. It beggars belief that anyone would want to do this." IT has stood undisturbed for decades - a simple, white headstone in memory of a brave Lothian soldier who died fighting for his country more than 90 years ago. But the final resting place of Private J Shepherd, from Haddington, is among dozens of memorials in a French cemetery to have been desecrated with Nazi graffiti. The grave of the Royal Scots soldier, who died at the Somme on October 26, 1916, was targeted over the weekend by vandals who scrawled swastikas and SS insignias on more than 30 headstones in the Peake Wood Cemetery, near Contalmaison. The vandalism has been condemned by the Commonwealth War Graves Commission and the McCrae's Battalion Trust. The trust's commemorative cairn to honour Edinburgh Royal Scots soldiers who died in The Somme stands just 500 yards away. Now they fear their monument could be attacked next, unless the vandals responsible are caught. Edinburgh historian Jack Alexander, a member of the McCrae's Battalion Trust, said: "We are worried that our cairn could be targeted. There are no security measures in place, so it could easily be targeted by the idiots who are responsible for this vandalism. It is rare to see any kind of Nazi graffiti daubed at war graveyards and it is the first time I have heard of it happening here. It's impossible to gauge the mindset of the kind of idiot who does something like this, but I hope they can be caught, otherwise more memorials could be at risk. People cannot turn a blind eye to this kind of vandalism. With Remembrance Day less than a month away, this is not the sort of thing we want to see happening to the graves of the soldiers who gave their lives during the war." The Nazi slogans were cleaned off by staff from the War Graves Commission after they were alerted to the damage. Peter Francis, a spokesman for the organisation, said the vandalism was a "shocking act of desecration" on the memory of the soldiers. He said: "It beggars belief that anyone would want to do this. Our colleagues in France were extremely upset when they discovered the vandalism and they are determined to find the perpetrators. Everyone is very shocked, angry and upset at this happening to a cemetery where many brave soldiers lost their lives. Nazi insignias had been daubed on 32 headstones in the graveyard. They have now been cleaned up to a standard befitting the brave men who gave their lives for their country. There is no indication as to who may have carried out this attack and there has never been any problem like this at the Peake Wood cemetery before. 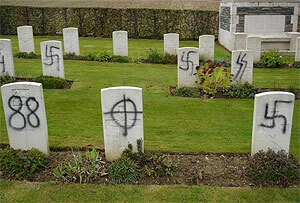 It is extremely rare to see any Nazi graffiti at our cemeteries at all, so we are taking this very seriously." The Royal Scots Regimental Association said it had not been made aware of the graffiti, but added it deplored the vandals. Private J Shepherd fought for the 13th Battalion of the Royal Scots. His service number was 13799, though little more is known about him. If you know more or are one of his relatives, please telephone 0131-620 8741. Cycling past the Donald Bell, VC Memorial near Contalmaison village cemetery is this erected by the Western Front Association in honour of the Manchester Regiment.